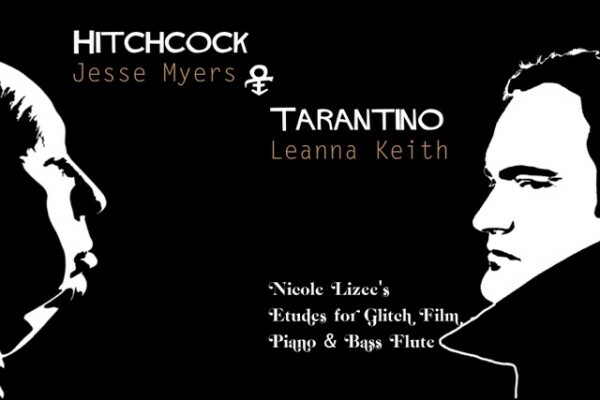 Jesse Myers (piano) and Leanna Keith (flute) collaborate in this concert to present two of Nicole Lizée’s etudes for glitch film. In her Hitchcock Etudes, the composer glitches and stitches scenes from “Psycho”, “The Birds”, “Rope”, and “The Man Who Knew Too Much”, all while superimposing live piano music on the soundtrack. In a similar manner, Lizée pulls from Tarantino’s “Reservoir Dogs”, “Pulp Fiction”, and “Kill Bill”, while a virtuosic bass flute solo is used to seam them all together. Check out what we believe will be an unforgettable audio-visual, avant-garde, cult film experience. Called a “brilliant musical scientist” and lauded for “creating a stir with listeners for her breathless imagination and ability to capture Gen-X and beyond generation”, JUNO-nominated composer Nicole Lizée creates new music from an eclectic mix of influences including the earliest MTV videos, turntablism, rave culture, Hitchcock, Kubrick, 1960s psychedelia and 1960s modernism. She is fascinated by the glitches made by outmoded and well-worn technology and captures these glitches, notates them and integrates them into live performance. Nicole’s compositions range from works for orchestra and solo turntablist featuring DJ techniques fully notated and integrated into a concert music setting, to other unorthodox instrument combinations that include the Atari 2600 video game console, omnichords, stylophones, Simon™, and karaoke tapes. In the broad scope of her evolving oeuvre she explores such themes as malfunction, reviving the obsolete, and the harnessing of imperfection and glitch to create a new kind of precision. Seattle-based pianist Jesse Myers is an adventurous explorer of music that expands the possibilities of the piano. With a strong interest in performance that pushes piano music into new realms, Myers frequently performs music for prepared piano, new music for piano and electronics, as well as traditional classical literature. He is a performer, educator, and composer with a goal of giving the audience a fresh perspective of the piano and an imaginative understanding of the music. His solo concerts have been featured in City Arts Magazine, KingFM’s Second Inversion, Seattle Weekly, The Live Music Project, and were a part of The Stranger’s Best Concerts of 2017 for three seasons. His recent work with the prepared piano and electroacoustic music has led to tours across the country including artist residencies and guest performances at Cornish College of the Arts, Capital University Conservatory of Music, Bowling Green State University, Lewis University. Myers has a Master of Music degree from the University of Washington in piano performance. He also attended Bowling Green State University, where he earned his Bachelor of Music in piano performance. His important teachers have been Robin McCabe, Virginia Marks, Valrie Kantorsk, Frances Burnett, and Marylin Shrude. A freelance flutist, improviser, and composer in the Seattle area, Leanna Keith delights in creating sound experiences that make audiences laugh, cry, and say: “I didn’t know the flute could do that!” She actively performs around the country in concert halls, bars, cafes, and classrooms, bringing along a menagerie of flutes that include her bass flute, alto flute, dizi, and shinobue, as well as a variety of electronics. She also is dedicated to playing music by composers who are still living, and advocates for the usage of music as social activism. She currently performs with the vocal/flute duo Stack Effect with vocalist Kaley Lane Eaton, Keith/Larson Duo with guitarist Zachary Larson, Crows at a Crosswalk with bouzouki player Daniel Husser, experimental chamber troupe Kin of the Moon, and the Japanese drumming ensemble Dekoboko Taiko. Ms. Keith is often sought as an clinician and private lesson instructor. She has taught masterclasses and workshops on a variety of subjects including: flute technique and tone development, extended techniques, composer collaboration, electronics and music creation, improvisation, and world flutes. She currently serves as the flute instructor for Cornish College of the Arts, as well as a teaching artist for the Seattle Symphony. She has a BM from the University of Nebraska at Omaha, and received a MM from the University of Washington.